A fun and enjoyable game for the entire family. 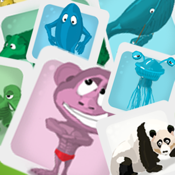 The game contains a lot of fun illustrations of different animals and fantasy creatures. The game is absolutely free and there are no possibilities of spending money in the game! So far Match Match Match have been downloaded more than 50.000 times. It is now possible to manually set the time it should take for a tile to turn around. This is done in the game under "settings"